James II defeated by William III, Ireland. On Easter Monday 24 April 1916, a rebel force from the Irish Volunteers, the Citizens Army and Cumann na mBan occupied the General Post Office, the Four Courts, Jacob’s Biscuit Factory, Boland’s Bakery, the South Dublin Union, St. Stephen’s Green and later the College of Surgeons. Once the GPO was occupied, Patrick Pearse read the Proclamation of the Republic. The alarm was raised when Second Lieutenant C R W McCammond RIR was attacked by rebels occupying Davy’s public house overlooking Portobello Bridge. He had been returning to Portobello Barracks (now Cathal Brugha Barracks) on horseback and eventually arrived there, albeit lightly wounded. The 3rd Battalion The Royal Irish Rifles (3 RIR) was stationed in Portobello Barracks and as a training establishment was responsible for training soldiers and sending them in 'drafts' to the Regiment; it was therefore garrisoned mainly by recruits. However, the Battalion was quick to react and moved two groups to capture Davy’s. 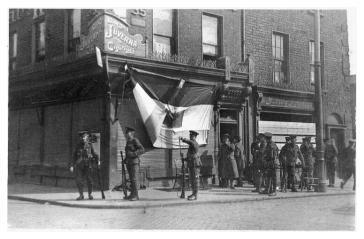 A second group moved to secure Dublin Castle and arrived after a battle with the rebels at the junction of Cuffe Street and Camden Street. A Second Lieutenant and 25 men made for the vital Dublin Telephone Exchange and succeeded in occupying it before the rebels arrived. This was an error by the rebels because ithe exchange was far more important than the General Post Office as it handled all military telephone communications vital to the British Army's command and control. The following day reinforcements arrived from Belfast, the Curragh and England; the composite battalion sent from the north included one company from 4 RIR. Dublin was now surrounded by a ring of military with heavy weapons. On Thursday 27 April, Major Sir Francis Vane, commanding Portobello Barracks, led a 150-strong column to attack the South Dublin Union Workhouse where rebels were preventing the progress of a supply column from the Curragh (military garrison). Although the lack of artillery prevented Vane from seizing the rebel-held location his actions did free the supply column. From the 27 April the main rebel stronghold at the GPO was cut off, and following an artillery bombardment the next day the rebels agreed to an unconditional surrender; the Easter Rising was over. One incongruous event concerned the Bank of Ireland guard provided by 3 RIR and commanded by Sergeant Morris. The guard resisted all attempts by the rebels to occupy the bank and as a reward the Bank of Ireland later presented £5 to Sergeant Morris, £3 to Lance Corporal Lehane and £2 to each of the six Riflemen. One of those men was 14430 Rifleman James Emerson, who was later commissioned into The Royal Inniskilling Fusiliers and awarded the Victoria Cross for his actions at Welsh Ridge in December 1917. He died as a result of mortal wounds he sustained when counterattacking and driving back German attacks.